Thank you for your interest in signing up for the PTF Spirit Rock. Please read the rules below carefully and then click on the sign-up button. The purpose of the MCS Spirit Rock is to be a fun family activity, promote school spirit at Mariners Christian School, and is intended to be used by only MCS students and families. The Spirit Rock fees will be used for PTF sponsored activities. We ask for your assistance in following the rules outlined below. Mariners Christian School Spirit Rock Guidelines. Dates fill up fast, so be sure to act quickly. Reservations MUST be made via Sign-up Genius in order to paint the Spirit Rock. A $25.00 non-refundable fee is required to reserve the Spirit Rock. You must pay at the time of your reservation and a receipt from Sign-up Genius will confirm your purchase. (Check your junk mail if you do not receive it.)? Once reserved, you may not change your dates. The family painting the Rock assumes liability for any individual or member of the group/organization who may be injured or who incur clothing or personal property damage. Only the Rock can be painted. Painting on fence, blacktop, lampposts, grass or any other structure is prohibited. Damage or destruction to any school property will deem the family financially responsible for cleaning and repair costs. You must also use the over spray tarp located behind the Rock to protect any nearby cars. The tarp should be place so that the cars are protected. It is our expectation that MCS families will show respect for our business neighbors and their property. 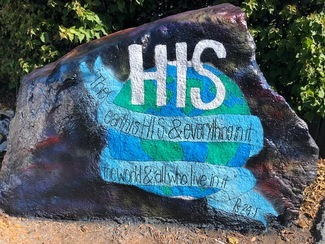 What is painted on the Spirit Rock must be in keeping our Student Handbook and Code of Conduct and reflect our Christian faith, honoring to God and others. Messages must be in good taste and may not contain any foul language discriminatory or political remarks. Profanity and obscenities are not permitted. School administration reserves the right to cover any message that does not adhere to this policy. No business advertising or organization promotion. TIP: The best paint to use is Rustoleum 2X Spray Paint. You will probably need 2-3 cans for a good base coat. It will depend upon the color you are using, the color already painted on the Rock and weather conditions. Remember, latex paint or paint that is rolled on will take longer to dry. UV Resistant Clear Coating spray may be used to protect from the rain. Thank you for supporting MCS PTF! PLEASE NOTE: The period to sign up and / or edit some items and events has ended. Contact the creator for more details. The sign up creator has set a maximum quantity limit of 3 for this sign up. You have reached the quantity limit setup by the sign up creator. You are not allowed to sign up for more than 3 total items on this sign up .